To get even better results from Supersmile® Professional Whitening Toothpaste, add this powerful Supersmile® Professional Whitening Accelerator. 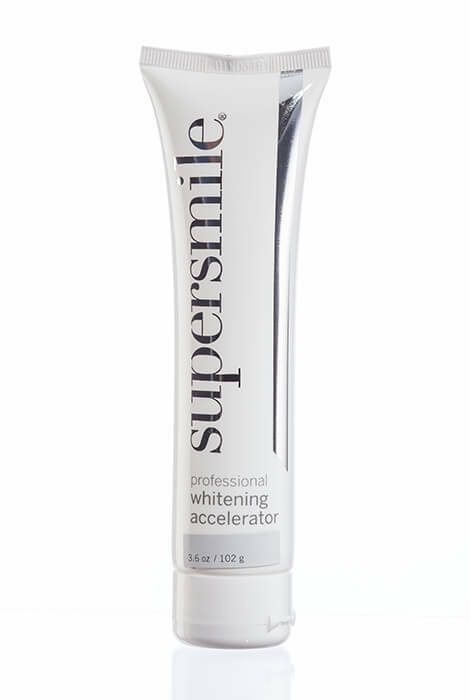 Superior to any whitening product on the market, this Supersmile accelerator is clinically proven to whiten teeth six shades when used in combination with the Supersmile toothpaste. Developed by the world-renowned "Father of Aesthetic Dentistry," Dr. Irwin Smigel, the teeth whitening accelerator contains safe yet powerful whitening boosters such as carbamide peroxide that deliver exceptional whitening results. Lifts deep-set stains and quickens the whitening process. Free of silica, parabens, sulfates, known allergens, animal by-products, and BPA. One tube lasts approximately 3 months. Must be used with Supersmile Professional Whitening Toothpaste. On a dry toothbrush, place a pearl-size drop of both toothpaste and accelerator. Brush in a circular motion for two minutes, twice daily. 4.2 oz.